Ryan Patrick Murphy (born November 9, 1965) is an American screenwriter, director, and producer. Murphy is best known for creating/co-creating/producing a number of successful television series, including the FX medical drama Nip/Tuck (2003–10), the Fox musical comedy-drama Glee (2009–15), the FX anthology series American Horror Story (2011–present), American Crime Story (2016–present), and Feud (2017–present), and the Fox procedural drama 9-1-1 (2018–present). He is also known for directing the 2010 film adaptation of Elizabeth Gilbert's best-selling memoir Eat, Pray, Love and the 2014 HBO film adaptation of Larry Kramer's The Normal Heart, which earned a Primetime Emmy Award for Outstanding Television Movie. Murphy was born on November 9, 1965, in Indianapolis, Indiana, where he was raised in an Irish Catholic family. He attended Catholic school from first through eighth grade, and graduated from Warren Central High School in Indianapolis. He has described his mother J. Andy Murphy as a "beauty queen who left it all to stay at home and take care of her two sons". She wrote five books and worked in communications for over 20 years before retiring. His father worked in the newspaper industry as a circulation director before he retired after 30 years. After coming out as gay, Murphy saw his first therapist, who found nothing wrong with him other than being "too precocious for his own good". During a 2012 interview on Inside the Actors Studio, Murphy claimed that he secretly dated "a lot of football players" in high school. He performed with a choir as a child, which would later inform his work on Glee. Murphy attended Indiana University Bloomington, where he majored in journalism. Murphy started as a journalist working for The Miami Herald, Los Angeles Times, New York Daily News, Knoxville News Sentinel and Entertainment Weekly. He began scriptwriting in the late 1990s, when Steven Spielberg purchased his script Why Can't I Be Audrey Hepburn?. Murphy started his career in television with the teen comedy series Popular, which he co-created with Gina Matthews. The series premiered on The WB on September 29, 1999 and ran for two seasons, ending in 2001. He then created the FX drama series Nip/Tuck, which premiered on July 18, 2003. In 2004, Murphy earned his first Primetime Emmy Award nomination for Outstanding Directing for a Drama Series. Murphy took the show's signature line, "Tell me what you don't like about yourself," from a plastic surgeon he met when he was a journalist researching an undercover story on plastic surgery in Beverly Hills. The series ended after six seasons in 2010. On May 19, 2009, Murphy's musical comedy-drama series, Glee, premiered on Fox. He co-created the series with Brad Falchuk and Ian Brennan. In its early seasons, the show was critically lauded. Murphy won his first Primetime Emmy Award for directing the pilot episode. The series concluded in 2015 following its sixth season. Murphy was one of four executive producers on the reality television series The Glee Project, which premiered on Oxygen on June 12, 2011. The show featured a group of contestants vying for the prize of a seven-episode arc on Glee, with someone being eliminated each week, until the winner is chosen in the final episode. The show was renewed for a second season, which ended up being its last. Murphy and Glee co-executive producer Ali Adler created the half-hour comedy The New Normal, which premiered on NBC on September 10, 2012. The series was based on Murphy's own experiences of having a child via surrogate, with the main characters, Bryan and David, named for Ryan and his husband. The series was ultimately cancelled after one season. Murphy and Falchuk created the anthology series American Horror Story, which premiered on FX on October 5, 2011. Some of the same cast have played different characters in different settings each subsequent season. In October 2014, FX greenlit a companion anthology series, American Crime Story, which Murphy and Falchuk executive produce. The series premiered on February 2, 2016. Murphy, Falchuk and Brennan next co-created the comedy-horror series Scream Queens, which premiered on Fox on September 22, 2015. The series was cancelled after two seasons. Murphy's next project, the drama anthology series Feud, premiered on FX in 2017. The first season focused on the rivalry between Bette Davis and Joan Crawford on the set of their 1962 film What Ever Happened to Baby Jane?. With newcomer Steven Canals, a research assistant for Dustin Lance Black before his Master of Fine Arts at UCLA, Murphy and Falchuk launched a new series set in the Ball community in mid-1980s New York City. Murphy had wanted to adapt Paris is Burning as a series and Canals had been writing a script while at graduate school centered on a young African American teen made homeless for being gay, who moved to New York with dreams of going to dance school and who became adopted by a House mother. Joining Canals, Murphy and Falchuk in the writing room were Our Lady J and Janet Mock, who Murphy also encouraged to direct an episode, making her the first trans woman of colour to do so, as well as the first trans woman of colour in a TV series writing room. The series premiered on FX on June 3, 2018, attracting critical acclaim. The first season boasted the largest cast of transgender actors ever for a scripted network series with over 50 transgender characters, all played by trans actors. On July 12, 2018, it was announced that the series had been renewed for a second season, which is set to premiere sometime in 2019. Murphy has also created/produced a couple of failed pilots. The WB sitcom pilot St. Sass, starring Delta Burke and Heather Matarazzo, was not picked up. In 2008, Murphy wrote and directed the FX pilot Pretty/Handsome, which also was not picked up. By April 2013, HBO had given a pilot order for Murphy's sexuality drama Open, which began filming in late 2013. By September 2014, HBO had opted not to proceed to series. In 2006, Murphy wrote the screenplay for and directed the feature film Running with Scissors. Based on the memoir by Augusten Burroughs, the movie version starred Annette Bening, Alec Baldwin and Brian Cox and, as the young Burroughs, Joseph Cross. In 2010, Murphy directed Julia Roberts in an adaptation of Elizabeth Gilbert's memoir Eat, Pray, Love. The film was a box office success but a critical failure, receiving harsh reviews criticizing its pacing and lack of credibility. To date, the film has grossed $204,482,125 worldwide. Murphy next directed the 2014 television film adaptation of Larry Kramer's Broadway play The Normal Heart, starring Mark Ruffalo, Roberts, Baldwin, Jonathan Groff, Matt Bomer and Jim Parsons. Murphy then collaborated with The Normal Heart executive producer Jason Blum to produce the remake of the cult-classic horror film The Town That Dreaded Sundown. The film was the directorial debut of Alfonso Gomez-Rejon and was also released in 2014. Murphy has several films in development: Dirty Tricks, a political comedy, One Hit Wonders, a musical comedy, and a sequel to The Normal Heart. In 2014, Murphy was developing a feature film of the life of reclusive heiress Huguette Clark, based on the best-selling book Empty Mansions: The Mysterious Life of Huguette Clark and the Spending of a Great American Fortune. 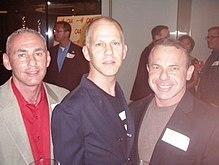 (l-r) Governor appointee Don Norte, Glee co-creator Ryan Murphy, and Norte's husband, gay activist Kevin Norte, at Spring Time GLAAD 2010's charitable event in Century City, Los Angeles, California. Murphy grew up in a Catholic household and continues to go to church. He serves on the National Advisory Board of Young Storytellers. He once owned a house designed by renowned mid-century modern architect Carl Maston. In an interview about his show Pose, which is set in 1987, during the height of the initial AIDS Crisis, Murphy described his concern about contracting HIV while at college, getting tested frequently even when celibate. Murphy has been married to photographer David Miller since July 2012. On December 24, 2012, Murphy and Miller welcomed their first child, a son named Logan Phineas, via a surrogate. In October 2014, they welcomed their second son, Ford. In October 2015, Murphy received the Award of Inspiration from amfAR, The Foundation for AIDS Research for his contributions to TV and film as well as his work in the fight against AIDS. In 2017, Murphy launched the Half Initiative, which aims to make Hollywood more inclusive by creating equal opportunities for women and minorities behind the camera. Less than one year after launching Half, Ryan Murphy Television’s director slate hired 60% women directors and 90% met it's women & minority requirement. In conjunction with the hiring goals, the Initiative launched the Half-Director Mentorship Program in which every director on every Ryan Murphy Television production mentors emerging women and minority directors through pre-production and post-production along with offering a significant stipend for their commitment. Filmmaker Kristin Fairweather, the first recipient of a HALF award, described her experience in an interview with Screen Comment's Rudy Cecera. 2011 American Horror Story: Murder House Episode: "Pilot"
2014 American Horror Story: Freak Show Episode: "Monsters Among Us"
2015 Scream Queens Episode: "Pilot"
2015 American Horror Story: Hotel Episode: "Checking In"
2018 The Assassination of Gianni Versace: American Crime Story Episode: "The Man Who Would Be Vogue"
In 2018, he was hired by Netflix with a compensation of $300 million for a period of five years. 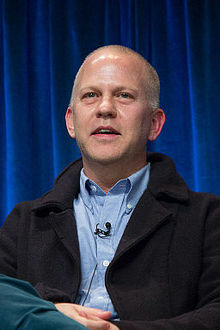 Ryan Murphy has won 6 Emmy awards out of 28 nominations as a producer, writer and director. ^ a b "Ryan Murphy Biography: Screenwriter, Director, Television Producer (1965–)". Biography.com (FYI / A&E Networks). Archived from the original on March 4, 2016. Retrieved February 14, 2015. ^ Martin, Denise (April 26, 2009). "'Glee' team rewrites the school musical". Los Angeles Times. Retrieved September 16, 2010. ^ Ziegler, Cyd. "'Glee' creator Ryan Murphy claims he dated 'a lot of football players' in high school." Outsports.com. 2012-04-10. Retrieved 2016-04-13. ^ Bialis, Michael. "Ryan Murphy Makes His Lighthearted Plea With Glee". blogcritics.org. Archived from the original on July 10, 2012. Retrieved October 28, 2010. ^ Seidman, Robert (September 21, 2009). "FOX sings praises of Glee with full-season pickup". TVbytheNumbers.com. Retrieved November 26, 2009. ^ "Glee". Academy of Television Arts and Sciences. Retrieved August 10, 2011. ^ Brown, Laurel (April 19, 2013). "'Glee' renewed for two seasons: FOX orders Season 5 and Season 6 early". Zap2it. Archived from the original on April 20, 2013. Retrieved April 21, 2013. ^ "Emmy® Award Winners Ryan Murphy and Dante Di Loreto Sign On To Executive Produce Oxygen's "The Glee Project"". Facebook. Retrieved January 23, 2011. ^ "Oxygen Picks Up Second Season of Critically Acclaimed "The Glee Project," Returning Summer 2012". Oxygen. January 17, 2012. Retrieved January 21, 2012 – via TheFutonCritic.com. ^ Goldberg, Lesley (January 27, 2012). "Ryan Murphy's NBC Comedy Lands Pilot Order". The Hollywood Reporter. Retrieved February 2, 2012. ^ Goldberg, Lesley (May 7, 2012). "NBC Gives Series Orders to Ryan Murphy Comedy, J.J. Abrams Drama". The Hollywood Reporter. Retrieved May 19, 2012. ^ Frankel, Daniel. "American Horror Story gets season 2 order from FX". Reuters. Retrieved October 30, 2011. ^ Mullins, Jenna (December 22, 2011). "American Horror Story Season Two Scoop: New House and (Mostly) New Faces". E! News. Archived from the original on January 7, 2012. Retrieved February 26, 2012. ^ Andreeva, Nellie (October 7, 2014). "American Horror Story Companion Series American Crime Story From Ryan Murphy Set At FX — O.J. First Topic". Deadline Hollywood. ^ Andreeva, Nellie (October 20, 2014). "Ryan Murphy & His Glee Co-Creators Get Fox Series Order For Comedy-Horror Anthology Scream Queens". Deadline Hollywood. ^ Wagmeister, Elizabeth; Birnbaum, Debra (May 15, 2017). "Scream Queens Officially Canceled at Fox After Two Seasons". Variety. Retrieved May 15, 2017. ^ Swift, Andy (May 15, 2017). "Scream Queens Cancelled at Fox". TVLine. Retrieved May 15, 2017. ^ Andreeva, Nellie (May 5, 2016). "FX Orders Ryan Murphy Anthology Series Feud, Jessica Lange & Susan Sarandon To Star In First Installment: Crawford v Davis". Deadline Hollywood. ^ a b c Marine, Brooke (July 7, 2018). "Janet Mock's Pose Directorial Debut Proves She's a Natural Behind the Camera". Retrieved November 19, 2018. ^ Hankinson, Bobby (July 20, 2018). "Pose Series Creator Steven Canals Discusses How 2018's Best New Show Came To Be". Towleroad. Retrieved November 19, 2018. ^ "Pose: Season 1". Rotten Tomatoes. Retrieved July 23, 2018. ^ "Pose: Season 1". Metacritic. Retrieved June 21, 2018. ^ Andreeva, Nellie (October 25, 2017). "FX's Pose: Ryan Murphy Sets Largest Transgender Cast Ever For Scripted Series". Deadline Hollywood. Retrieved November 16, 2017. ^ "New Ryan Murphy Musical Dance Series Pose Gets Full Season Order". Broadway World. December 27, 2017. Retrieved December 27, 2017. ^ Otterson, Joe (July 12, 2018). "Pose Renewed for Season 2 at FX". Variety. Retrieved July 12, 2018. ^ Nilles, Billy (May 9, 2018). "Ryan Murphy Announces 100 Percent of His Pose Profits Will Be Donated to LBGTQ Charities". E! Online. Retrieved November 20, 2018. ^ Murphy, Ryan [@MrRPMurphy] (May 17, 2018). "POSE GIVES BACK ORG OF THE DAY: Transgender Legal Defense & Education Fund. Their mission is to end discrimination and achieve equality for transgender people, particularly those in the most vulnerable communities. www.transgenderlegal.org" (Tweet). Retrieved November 20, 2018 – via Twitter. ^ Murphy, Ryan [@MrRPMurphy] (May 15, 2018). "POSE GIVES BACK ORG OF THE DAY: Callen-Lorde. This organization is the global leader in LGBTQ healthcare. Since Stonewall, they've been transforming lives free of judgment and regardless of ability to pay with the belief that healthcare is a human right" (Tweet). Retrieved November 20, 2018 – via Twitter. ^ Birnbaum, Debra (May 9, 2018). "Ryan Murphy on What Inspired Him to Donate Pose Profits to Trans and LGBTQ Charities". Variety. Retrieved November 20, 2018. ^ Andreeva, Nellie (February 17, 2011). "FX Orders Pilot From Ryan Murphy & Brad Falchuk, Duo Remains Committed To 'Glee'". Deadline Hollywood. Retrieved September 8, 2011. ^ Andreeva, Nellie. "Ryan Murphy's Provocative Relationship Drama 'Open' Lands At HBO With Pilot Order". Deadline Hollywood. Retrieved April 14, 2013. ^ "HBO Not Moving Forward With Ryan Murphy Sexuality Drama 'Open'". The Hollywood Reporter. September 11, 2014. ^ "Eat Pray Love". Box Office Mojo. Retrieved February 26, 2011. ^ Kit, Borys (January 20, 2012). "Julia Roberts, Alec Baldwin, Matt Bomer and Jim Parsons to Star in Ryan Murphy's Next Film". The Hollywood Reporter. Retrieved February 2, 2012. ^ Kit, Borys; Goldberg, Lesley (January 17, 2013). "Ryan Murphy and Jason Blum Teaming Up for MGM's Remake of 'The Town That Dreaded Sundown'". The Hollywood Reporter. Retrieved September 5, 2014. ^ "Ryan Murphy Options Movie Rights To Bestseller 'Empty Mansions'". Deadline Hollywood. March 14, 2014. Retrieved October 11, 2014. ^ Poniewozik, James (March 7, 2005). "Queer Eye for Straight TV". Time. Retrieved August 20, 2008. ^ "Carl Maston". LA Curbed. Retrieved October 11, 2014. ^ Bentley, Jean (July 11, 2018). "Pose: 10 Surprising Facts About Ryan Murphy's Trans-Inclusive Series". The Hollywood Reporter. Retrieved July 14, 2018. ^ "Ryan Murphy Second Child: Glee Creator Welcomes Baby Via Surrogate With Husband David Miller". Us Weekly. October 6, 2014. Retrieved October 11, 2014. ^ Zumberge, Marianne (September 30, 2015). "Lady Gaga to Perform at amFAR Event Honoring Ryan Murphy". Variety. ^ Cecera, Rudy. "A conversation with recipient Kristin Fairweather about Ryan Murphy's HALF Initiative". Screen Comment. Retrieved 20 October 2017. ^ "'Glee' creator Ryan Murphy to Kings of Leon: 'F-- You'". Entertainment Weekly. Retrieved October 11, 2014. ^ "'Glee' creator Ryan Murphy to Kings of Leon: 'F-- You'". Entertainment Weekly. Retrieved January 12, 2019.